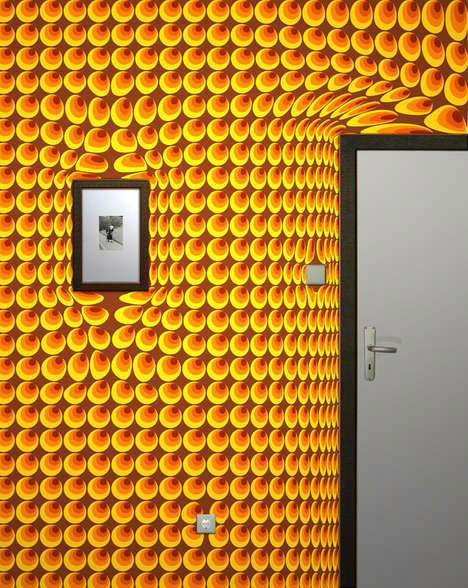 Light-emitting wallpaper owes its appealing luminescence to light-emitting diodes (LEDs) embedded in the wall covering. 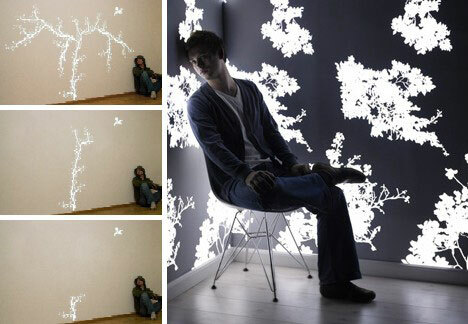 Tiny, thin and cool, LEDs allow wallpaper designers like Jonas Samson of The Netherlands to create innovative wallpapers that double as light sources – they can even be adjusted to provide as much light as needed or desired. 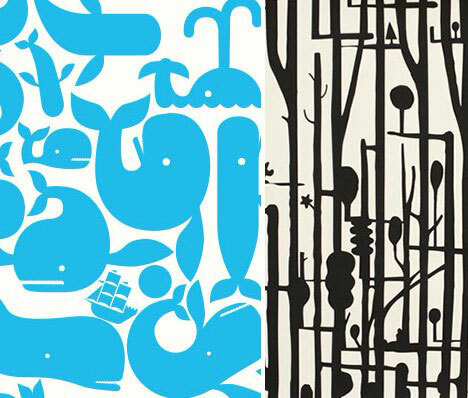 Interactivity can liven up wallpaper in a hurry, as these color-changing papers by artist Shi Yuan illustrate. Heat rising from a wall-mounted radiator causes a berry bush to bloom while above right, the warmth of one’s hands add color to a previously monotone background. 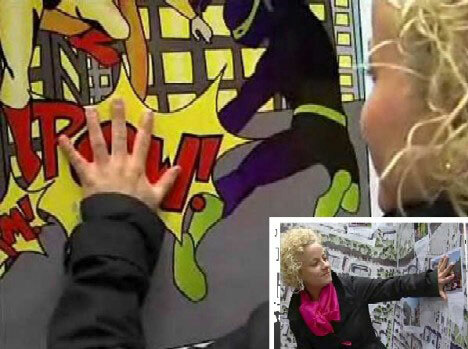 Wallpaper can also be made sensitive to touch, responding to gentle pressure with an audible response. At least, that’s the case with so-called “smart paper” developed by Page Four, a research project at Mid Sweden University’s Fiber Science and Communications Network in Sundsvall, Sweden. Paper Four, as the wallpaper is called, contains touch sensors and special speakers that are imprinted into the paper using conductive inks made with silver particles. If painting wallpaper with silver sounds expensive, then you might want to consider papering the walls with actual money – dollar bills. Most people have noticed a dollar or two taped to the wall of a business establishment; supposedly the first dollar they ever made. What would happen if another dollar was added every time a transaction took place? 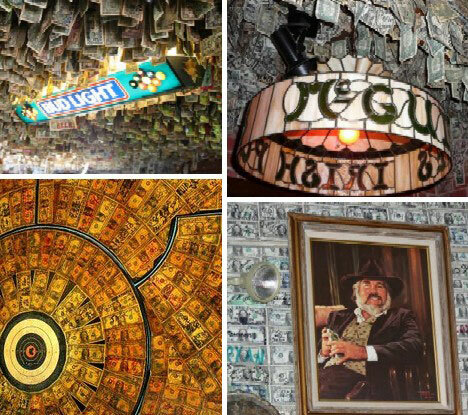 he results can be seen above at (clockwise from left) the No Name Pub in the Florida Keys; McGuire’s Irish Pub in Pensacola, Florida; and from the great state of Arizona: the Oatman Hotel and the Tortilla Flat Saloon. Seems like these places have money to burn, though a fire at any one of them would see a fortune go up in smoke! 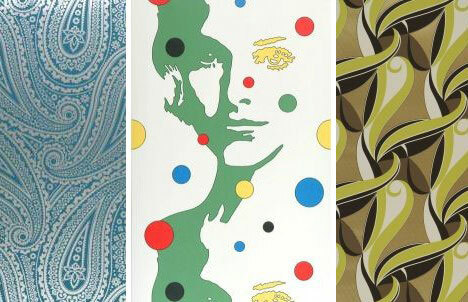 Notes of a different kind make up the above wallpaper, Pixelnotes from artist and graphic designer Duncan Wilson. 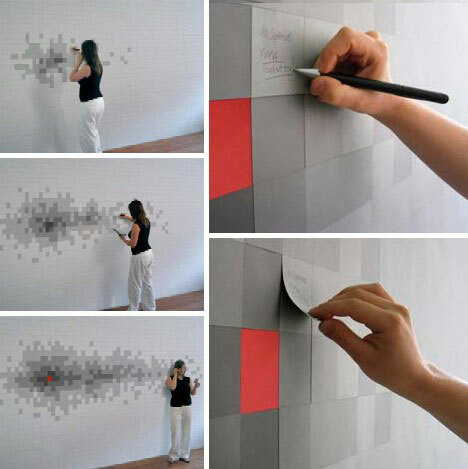 The wallpaper is made up of four layers divided into individual squares resembling sticky notes. The notes can even be written upon and detached, exposing a different colored note from the layer beneath. As notes are removed, a pattern begins to reveal itself. 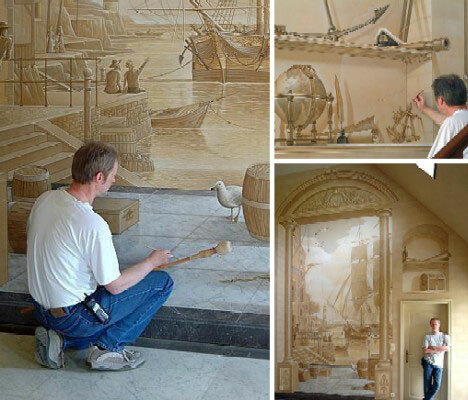 The above wallpaper from a Vietnamese website is an exceptional example of trompe l’oeil, a style of art that translated from French means “fool the eye”. The artist (sadly uncredited but possibly Canadian) uses lighting, perspective and proportion to add a third dimension where before was only blank, flat space. 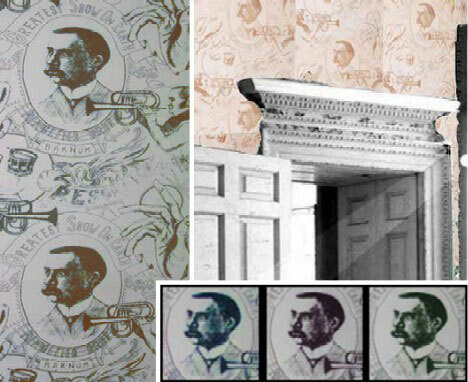 If the trompe l’oeil look seems somewhat old fashioned, then the iconic hand-printed wallpaper above is even more so. Called “The Greatest Show On Earth”, artist Daniel Heath uses circa 1870 Victorian imagery interspersed with portraits of famed circus promoter P.T. Barnum – the effect is reminiscent of currency down to the color choices: blue, green and sepia. 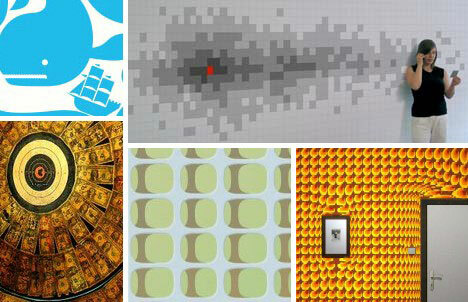 Also from the seventies – the Nineteen-seventies that is – are these retro-cool wallpapers that shout out the essence of the Me Decade. Offering a variety of patterns ranging from Romantic to Surreal, these wallpapers gone wild remind us that like it or not, the era of disco isn’t quite dead yet. 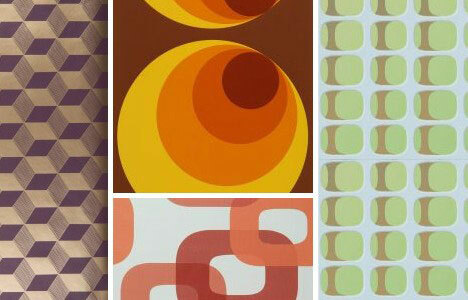 Above are a few more samples of ’70s wallpaper, these are from Wallpaper from the 70s’ Abstract collection. Was the nation suffering from a decade-long psychedelic flashback, one wonders? The originators of Warping Wallpaper were at least inspired by counterculture themes; how else to explain wallpaper that makes you feel like you’re high, even if you aren’t? 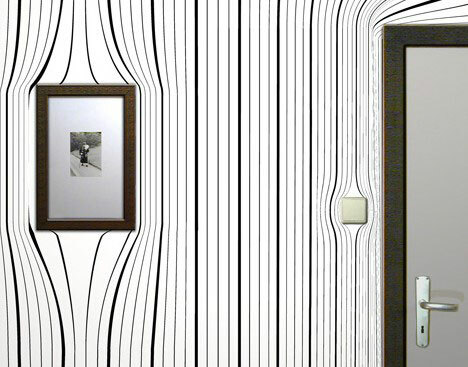 Created by Surrealien – an appropriate name if there ever was – these dizzying wallpapers tend to be more artistic than practical. Above is another eye-challanging Surrealien design; they’re from Germany by the way. 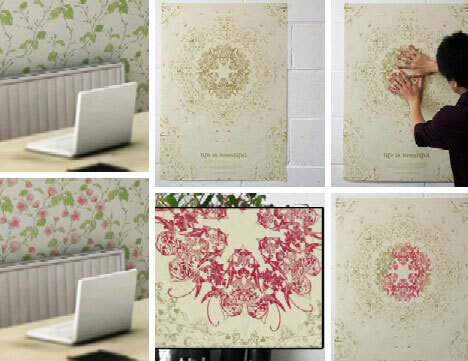 According to the website copy, “Our product dissolves limits between architecture, wallpaper and hangings, with the wallpaper functioning as sensitive gobetween. So it’s time to: Warp your room!” And, presumably, your mind. Mountain yetis, blue whales and a stark forest that just might be magnified mold are the highlights of the selection of wallpapers from Pottok shown above. Each style is hand silk-screened on recyclable paper using water based inks. 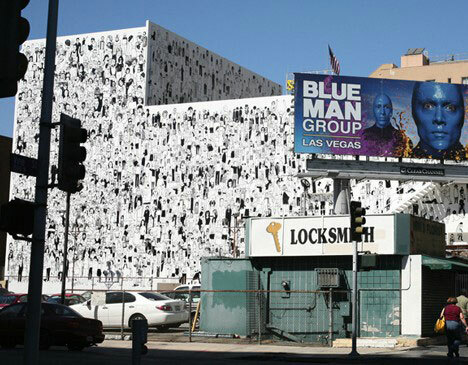 Pottok also provides what only can be described as outdoor wallpaper” that, in the case of the Montalban Theater on Vine St. in Hollywood, completely covers the building’s exterior. 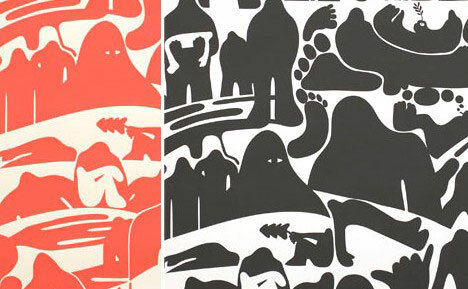 Pottok’s lead artist Geoff McFetridge isn’t saying what the inside of the theater looks like, but it would be no surprise if the wallpaper’s pattern was “brick”.